Vultures, like these Turkey Vultures here, have an image problem. You know the cartoon cliché of a man dying of thirst in a desert, vultures circling, patiently waiting for the man to expire. It’s true that vultures dine upon death, but without such scavengers, we would be up to our eyeballs in slowly decomposing bodies — assuming the corpse-eating bugs and microscopic life were at least still on the job. This time of year, Turkey Vultures roost together in large numbers on the high-voltage power line towers about a half mile from my house. When morning temperatures rise above freezing, they lift off and often slowly circle over my house and the adjacent woodlands until they disperse in small groups to find a broken body for breakfast. As sunset approaches, they circle again overhead in increasing numbers until some tacit signal sends them all to their nighttime roost. I think Turkey Vultures are excellent examples of creatures doing their best with the circumstances thrust upon them. Their naked heads may be practical — easier to clean — but let’s be candid — they are not breathtakingly beautiful birds. They remind me of bald old men — a bit cranky as they argue over a meal, or jostle for the sunniest spot on a winter-bare tree limb. Yet, they endure, and even thrive filling a vital ecological niche that ensures a less messy landscape for us, and survival for them. And they know how to make the most of an unseasonably warm winter day. Yesterday was such a day at my house; the Turkey Vultures turned it into a spa day in and above the creek adjacent to my property. From my back deck, I had an excellent view as about a dozen of them gathered on sycamore branches leaning over the water. One at a time, they took turns fluttering down to a wide sand bar. With wings slightly extended, each waded slowly into the water until only its head remained unsubmerged. Due to almost no rainfall in the last couple of months, the current is quite sluggish, so the birds were in no danger of being pulled downstream. Each bird would linger in this mostly submerged position for about 30 seconds, then slowly wade back up to the sandbar, and shake its feathers vigorously. It then fluttered back up to a low-hanging branch, fully extended its damp wings, and let the sun dry its feathers while another bird took its turn below. Their pool party lasted about two hours, only ending when the sun dropped below the tree line, casting their sycamore perches into shadow. They lifted off, circled, and headed for the power line towers, having squeezed maximum enjoyment from an uncharacteristically warm winter’s day, and reminding me of the importance of grabbing the most joy I can from every possible moment. 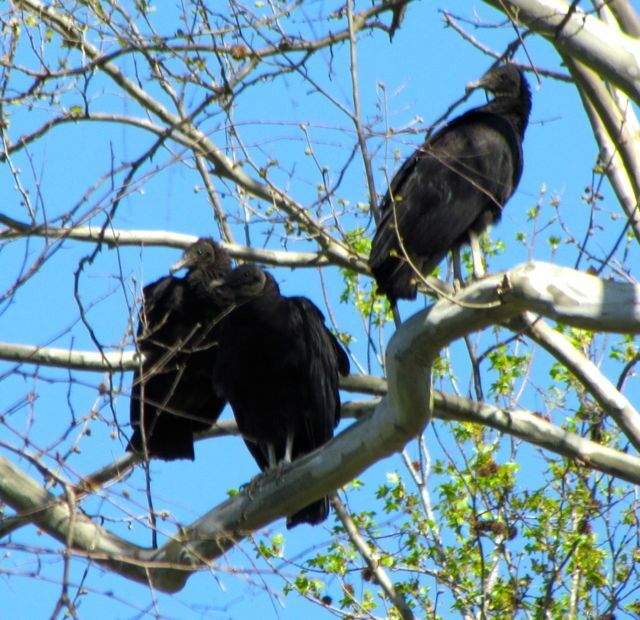 Party on, Turkey Vultures, and thanks for the lesson in mindfulness. 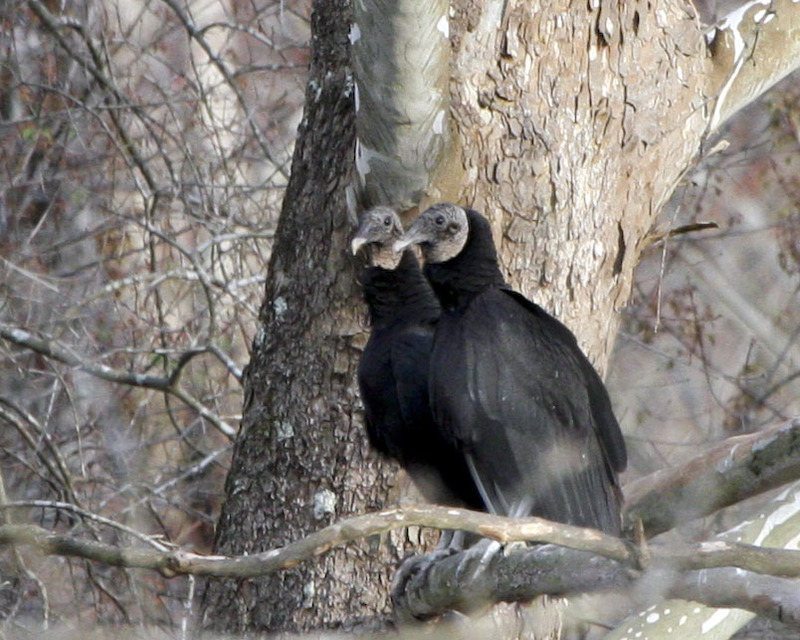 An early spring gathering of Black Vultures on a favorite sycamore branch. This entry was posted on December 28, 2016, 12:12 pm and is filed under Native Wildlife, piedmont gardening. You can follow any responses to this entry through RSS 2.0. You can skip to the end and leave a response. Pinging is currently not allowed.